Every county had churches and isolated (Anglican) chapels known as 'places of resort' where the clergyman would marry anyone to anyone if they crossed his palm with silver. Often these were tiny parishes with little income of their own. In Buckinghamshire, a parish with a total population of 20-25 had an average of 23 marriages a year, and similar examples were found all over the country. Some of these clergy seem to have laid in a job lot of licences, which they issued at cut rates to all comers. There is a testy complaint that one un-sporting groom had 'come with his own licence', thus cutting retail profits. Londoners, even, came out to country parishes, and countrymen went up to town, to places like St James Dukes Place, where this easy-going attitude prevailed, to the extent of 30 to 40 marriages a day. Ecclesiastical sanctions were brought against some of the London clergy who had most offended, which left the way clear for the non- beneficed marriage mongers. The parish clergy could do little against them, and even threats of imprisonment were to no avail, for most of them were already prisoners. Younger sons of gentry often took orders while they were at University without any intent to serve a benefice, with the idea that if a fat family living became vacant when they were ready to settle down, they would be qualified. Meanwhile, they pursued the common rackety course of life of gentlemen of the time, and often ended up in debt, and in a Debtors' Prison, of which the most famous was the Fleet in Faringdon Street. Originally, marriage took place inside the prison, and when this was stopped, the debtor-clergy obtained permission to live just outside it, in the 'Rules or Liberties' of the Fleet. Here the parsons would marry anyone for a fee, day or night, and they did a roaring trade with sailors on shore, visitors to London, and couples whose families opposed the match. If the husband repented of the bargain, they would tear the page out of their 'registers' for a further fee. Several of the notebooks kept by these parsons have been deposited at the Public Record Office and some years ago a transcription was started, which seems to have vanished. There are transcripts of some of the minor churches which operated a marriage racket. Some of the clergy made ample money to get them out of gaol, but preferred to stay within the 'Rules' or opened Marriage shops, with facilities for the ceremony and the wedding breakfast too, on the fringes of London as it then was. So did innkeepers, spotting a profitable sideline, with ample clergy on tap. A famous one was St George's chapel, Mayfair, run by the Rev. Alexander Keith, whose clientele was massive and varied. Because of later property development, a marriage at 'St George's Mayfair' sounds classy, but at the time it was a raffish area (as parts still are). The marriages were legal (after some argument in court) but not always stable, since many couples knew little about each other. Some of the sailors came back with another bride next leave, and one lady married two men in one day. It was quick, cheerful and probably filled a need for more than those for whom it dug a pit. While it only involved members of the lower and lower middle classes, no one much bothered, though the higher clergy denounced the practice from time to time. But the marriage shops would also cater for the runaway heiress and her lover, asking no proof of age or consent of parents. Once a girl was married to a fortune hunter, she was ruined as currency on the marriage market. The husband could claim dowries and other sums left 'at her day of marriage' and use them as he wished. Even if she repented of the bargain, the husband would still have the chance to run through her fortune, since divorce was rare and cumbersome. It was this abuse, which affected the pockets and pride of the legislating classes, which led to the passing of the Hardwicke Act 'for the better prevent of Clandestine Marriage' in 1753, whose effects have already been described. Thomas Jackson, Jr.'s, father and mother-in-law were also married there. Why isn't evident, and given the very large number of marriages performed, it's hard to think all were "clandestine." Whoever Sarah was, she died not long after John was born. Her death isn't recorded in the burials in St. James or St. John parishes in Clerkenwell, but it was likely that Thomas remarried there in 1756. St. James records have a Thomas Jackson marrying Mary Allcock. Thomas was of Christ Church parish, probably in Greyfriars (vs. Spitalfields) and Mary was of St. James Clerkenwell. The family may have moved to Clerkenwell at that time. Evidence leaves no doubt he was the "turner and glass cutter" living on Mutton Lane, Clerkenwell, at least between 1759 and 1788. He was at "the sign of the Golden Coffee Mill" at the "bottom of Clerkenwell Green," where Mutton Lane ended. He was still being listed in directories after 1788. London glass making histories refer to Thomas Jackson being succeeded by Jackson & Sons from 1768 to 1800. Nothing further has been found about this, but if Thomas, Jr., and John Jackson (who is known to have been a glass cutter) took over a business called (Thomas) Jackson & Sons, this may explain why his name continues in directories posthumously. Thomas' will names his wife Mary, sons Thomas and John, daughter Mary (wife of John Blunt) and grandson Robert Morrison. A codicil also names Thomas, Jr.'s, daughter Sarah and the children of his son John. Mary (Allcock?) Jackson was probably the mother of the two Jackson daughters. Sarah may not have known her grandmother's name given her early death, explaining why it doesnt' appear in the Bible. It is mentioned in the Old Bailey case that Jackson's employees worked with ebony, and "glass cutters" are elsewhere referred to as cut-glass workers. 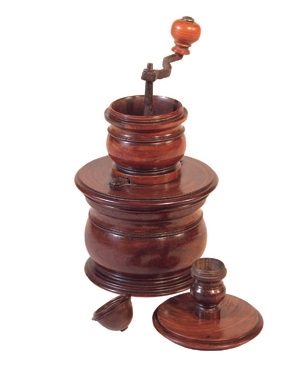 The image below shows a Georgian period coffee mill, something that would have been turned on a lathe out of hardwood, thus explaining the sign over the shop door. It must have been Thomas Jackson, Sr., who registered his gold and silver mark, "T J" in an oval, on 30 September 1769, residence on Mutton Lane. (3) Thomas, Jr., was still a minor at 18. Listed among the "large plate workers" in gold, the meaning of which hasn't specifically been found, but seems to generally be tableware. No other reference has been found to him working in gold. (4) The "J" in these marks appear as an "I," which was a common, alternative way to render that letter. John, b. 4 January, bap. 20 January 1755, m. Phoebe Thompson? sources for vital records: His birth is recorded in a family Bible. His marriages come from London parish registers abstracted at familysearch.org. Both marriages are based on circumstantial evidence. 1. The poll of the livery of London, etc. (London:1768), p. 59. 2. http://www.oldbaileyonline.org.uk/browse.jsp?id=t17590228-6&div=t17590228-6&terms=thomas%20jackson#highlight, Reference Number: t17590228-6, 28 Feb 1759. 3. Sir Ambrose Heal, The London Goldsmiths, 1200-1800, etc. 4. Montague Howard, Old London silver, its History, its Makers and its Marks (London:1903), p. 314.